Ayọ heißt eigentlich Joy Olasunmibo Ogunmakin und kommt aus der kleinen Stadt Frechen in Nordrhein-Westfalen. Ihre Wahlheimat und Inspiration sind jedoch Frankreich und die Stadt Paris, was man auch ihren Texten und ihrer Musik immer wieder anmerkt. Zum Beispiel auf ihrem selbstbetitelten Album »Ayo«. Der Artikel Ayo. (Germany): Ayo wurde in den Warenkorb gelegt. Nach vier Alben und mehr als 1,5 Millionen verkauften Tonträgern verschmilzt Ayo auf ihrem neuen Album wieder gekonnt Einflüsse aus Soul, Reggae, Folk, Pop und HipHop. Die 14 Songs des neuen selbstbetitelten Albums wurden allesamt von ihr selbst geschrieben, produziert und arrangiert. Sie gibt einen tiefen Einblick in ihre Seele, teilt ihre Erfahrungen und zeigt was sie bewegt. Mit viel Emotion und Gefühl singt sie über Liebe, Traurigkeit, Angst und Hoffnung. After 1.5 million records sold in 40 countries with her four previous releases, the soul singer Ayo comes back once again with a lively fifth album. It's not typical for an artist to self-title their fifth album. That's normally meant for debut records. But, while Brooklyn-based singer / songwriter Ayo has four records under her belt, it's actually quite fitting that she chose the eponymous title. The 14-track record, which exquisitely blends folk reggae and pop with soul influences and a dash of hip-hop, marks many firsts for the artist and serves as her musical rebirth. 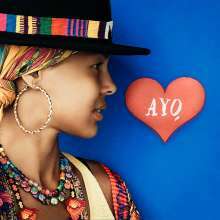 The musical mission is crystal clear on Ayo: make beautiful music seeped in positivity, love, and light and that makes people feel something. »This is not a record for people who like to sit down and think and analyze. This is a record for people who want to feel... just feel and simply be«, she says. Ayo (which means »joy« in her father's Yoruba language) has sold 1.5 million records in 40 countries with her four previous releases. Her debut album, Joyful, hit Top 10 in four countries, while Essence magazine compared her to the great Nina Simone. She's performed with Babyface, won prestigious European music awards, has appeared stateside on Late Show with David Letterman and The Late Late Show with Craig Ferguson and even fortunate enough to open for the funkiest man on the planet, James Brown on one of his last big shows.